"Uniform: Molloy College A - 3" by Normadeane Armstrong Ph.D, A.N.P. This is a student uniform from Molloy College. The dress is made from a pink and white striped cotton fabric, while the apron and cuffs are all made from a white starched cotton fabric. 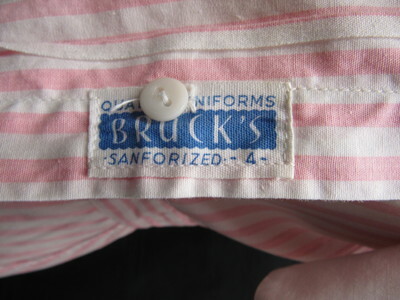 All items were produced by Bruck's Quality Uniforms. This uniform is presumed to be originally owned by an "M. McGunnigle" as this name appears on the inside of the neckline. This uniform seems to be missing the detachable collar that would have been worn at this time. The apron separates into two pieces at the waist and is safety pinned together. A name tag pin (not shown here) would have been worn on the left side of the apron at this time. To view an original Molloy College name tag pin please follow the link below. This measurement is the dress size taken from the manufactures tag.